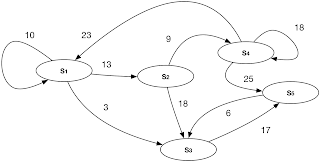 Although we can discuss this topic from mathematical point of view and specifically Markov process model but it is not that much difficult to talk about it in plain english too. What I want to talk about it is that we can use what we've talked about during last 2 or 3 posts to build a network of information to find out the most probable state of a system or process. So it simply shows if you are in state S1 the most next probable state will be S2 then S1 and finally S3. Our monitoring or learning shows while you are in S1 there is no chance to be in any other states than these three. 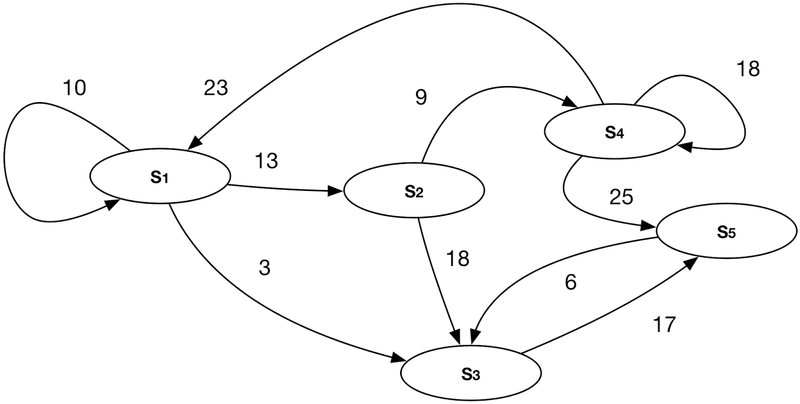 As you see just after a while of monitoring the system and transforming its state to a Bayesian Network like graph, we can have a graph which clearly shows the probability of system's next state based on the current state. Which means state of the system at time t+1 is just a function of its state at time t. Just note that F is not an ordinary function it works on vectors, you can somehow consider it as some high dimension matrix or tensor of course, we will talk about it pretty soon and better than that, we will bring some easy to digest examples on how we can predict the future state of a system in practice.